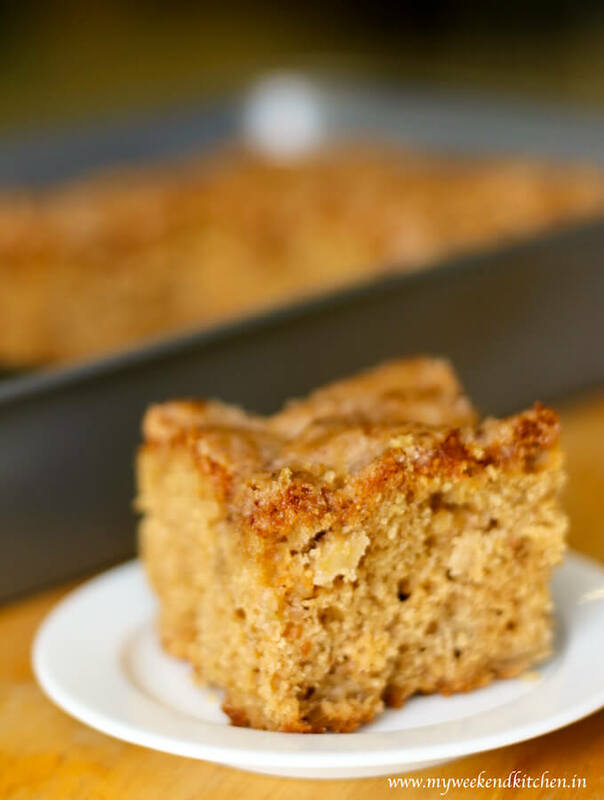 A little sweet, a little spicy, this apple cinnamon cake is like a mouthful of warmth and sweet love. The cinnamon crumble topping elevates the simple cake to heavenly, especially when served warm! Food is never just food. It’s an excuse to bring people together; it’s a celebration of special and ordinary days. When we were kids, friendship day was a big deal. We would make friendship bands and carry them in our pockets to tie on the wrists of friends. At the end of the day, we’ll be sitting in the school canteen counting and admiring each other’s bands. Did you also make friendship bands? But then something happened. We grew up. We got busy, we had families and friendship day was forgotten between Mother’s Day, Father’s Day, daughters day, anniversaries and birthdays. But this time I wanted to go back to school. I wanted to celebrate friendship. So once every week, for the whole of August I baked for friends known and unknown. To reach out to that stranger friend on the street with a platter full of warm cake. Wouldn’t you agree that Apple and cinnamon are the best of friends? So what better way to start friendship day celebrations than with this wonderful Apple and cinnamon cake recipe. This recipe makes a big batch and that was perfect for sharing. If you like this recipe, please take a moment to rate it below and/or leave your thoughts at the end. It really encourages me to keep exploring, learning and improving. 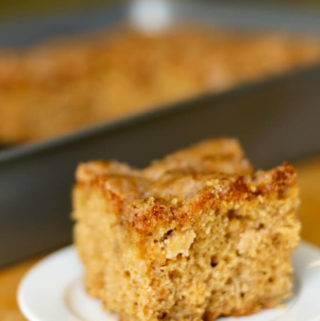 A little sweet, a little spicy, this apple cinnamon cake is like a mouthful of warmth and love. The cinnamon crumble is the show-stopper, especially when served warm. The recipe makes a big batch to share the goodness generously. Preheat oven to 160ºC (~325ºF). Grease and dust a 9”X13” pan. In a mixing bowl, beat together brown sugar, oil, egg, buttermilk*, baking soda, ½ tsp cinnamon powder and vanilla until frothy. Fold in flour in the wet mixture, one-third at a time. Follow by mixing in the chopped apples. For the cinnamon frosting, combine the castor sugar, butter and 1 tsp cinnamon powder to make a crumble topping and sprinkle it evenly over the cake batter. Bake for 45 minutes or until a toothpick or a cake-tester comes out clean. Remove from the oven and let it cool a little before digging in! Buttermilk is of a little runny consistency, I used half thick yogurt and half low fat milk to prepare 1 cup. Don’t throw the peels of the apple. If you can’t use them immediately, simply put them in the freezer and use them later in oatmeal,smoothies and herbal teas. Check out the image below for ideas to use fresh or frozen apple peels. Recipe inspiration from Pinch of Yum. Left with too much apple peels? Don’t worry! Chop the leftover peels into small bits and freeze in an airtight bag. Apple peel and berry smoothie: Add them to your favourite berry smoothie to add extra fibre. Apple peel tea: Boil apple peels with sugar, cinnamon, cloves and water to make refreshing hot or cold apple tea.